In this video tutorial, you use components from Flat UI Pro and the steps from the previous video in the series to use LESS settings to create horizontal menu navigation. You will learn to move a design from Adobe Photoshop to your development site, using LESS and by creating CSS. The tutorial explains how to set proper spacing and variable settings so that your final menu navigation will have a professional look and feel. The tutorial is easy to follow using any platform or editor to develop basic CSS. 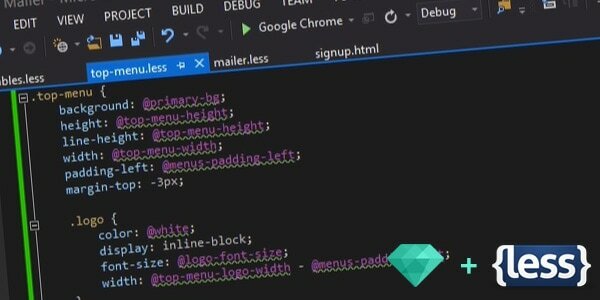 You will need basic web design and coding knowledge to easily complete this tutorial. A familiarity with Photoshop is also recommended. What you will learn in this tutorial: How to use LESS styles and HTML to create Horizontal menu navigation. Yes, how did you do that to VS? It’s actually a setting within VS. You can change the theme to the “Dark” setting. There’s also a website out there that has a ton of custom Visual Studio themes as well. What’s the name of the color scheme you are using? I’m using Flat UI Pro so the majority of the colors I’m using are included in the kit. Curious to see how you will do the vertical menu ;P.
I just didn’t understood why you used scroll in the search icon and what it actually do. I’m also curious about this. Why wouldn’t you use auto instead? Actually, it didn’t need to be in there at all. Sometimes I get too hasty while recording these things. Thanks for catching that! is all that I see completely made with the Flat UI Pro kit? or dit the maker of the video add custom design? when I look at the Flat UI page.. I only see this happy gayish power puff design unlike the superhere cool Square UI design.. which could be used for batman’s custom cms. Yes, this design and code is based on Flat UI Pro. Do you have screenshots, like you have of SquareUI’s components etc? I would like to see more of Flat UI Pro. All Flat UI screenshots are here https://designmodo.com/flat/ , we not have additional screenshots or elements.